How to Easily Renovate Your Kitchen without Moving Walls — KTJ Design Co. 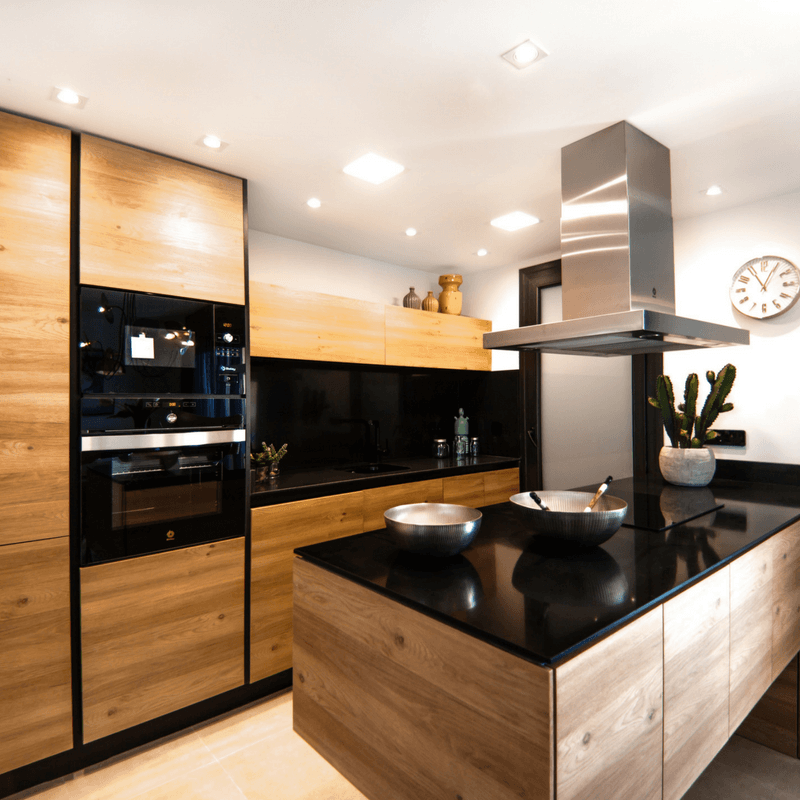 The minute a homeowner considers remodeling their outdated kitchen, their first impulse is to knock down a wall to “open up the space.” Often times, this is not the best approach—financially or visually. Contrary to this popular trend, retaining your existing footprint will save you tons of money and time when you decide to renovate your kitchen. Why? Well, anytime you move plumbing pipes or electrical wiring, it is going to cost (a lot). The upside to keeping the same layout is that you have many alternative ways to take full advantage of the space and function of your existing kitchen. No sledgehammer or budget overages required. Check out my pro tips here to get a dreamy kitchen without moving a wall when your renovate your kitchen. The biggest complaint I get from clients is that they don’t like their yellowed oak cabinets. The oak itself is not yellow, but the finish—generally a lacquer—has yellowed with age. If your current cabinets are of a good quality, you can update them with a refinish or a fresh coat of paint. Don’t try to DIY your cabinet refinishing or painting process when you renovate your kitchen. Properly upgrading cabinetry requires techniques and tools that are almost exclusively found in professional refinisher workrooms. If you’re tired of the jewel-toned cabinet trend, simply re-stain the lower cabinets a rich walnut color and paint the uppers only (again, hire an expert). Design Tip: We love navy blue kitchen cabinets. I recently toured a Showcase House in San Francisco where designer Ian Stallings painted the luxurious kitchen cabinets a stunning shade of navy. It is breathtaking! I often find that the size of my client’s kitchen isn’t the problem. Rather, the main issue is the lack of organization. If your enclosed kitchen feels claustrophobic, considering bringing in daylight by expanding or adding new windows, skylights or solar tubes. This will make your kitchen feel airy and contemporary. Don’t forget to add overhead lights, focused pendant lamps and under-the-cabinet fixtures. You can read more about kitchen lighting here. Select appliances that are suited to your space. As gorgeous and trendy as commercial-grade cooktops and ovens are, do you really need that robust of a cooktop or oven? Most households don’t require gourmet appliances. I know you think that cooking with gas is better, but is it really? The fumes emitted are quite unhealthy and dirty, requiring big ventilation systems. Instead of a gas stove, I recommend the Next-Gen induction cooktop. Induction cooktops offer the ease of electric power and the control capabilities of gas. They are faster and more energy-efficient than standard electric cooktops, and they don’t create open flames or fumes. A sleek, pro-grade induction cooktop could be a great choice for your kitchen appliance upgrade. Just because your kitchen is separate from the family room, doesn’t mean it has to be closed off or claustrophobic. Update your existing footprint with painted cabinets, smart storage solutions, natural lighting, and upgraded appliances to make your current kitchen your dream kitchen.